New measures could include oversight committee, suspensive veto and greater public consultation, writes former Senator Pierre De Bané. This editorial by former Senator Pierre De Bané is part of a series about the renewed Senate by former Senators. De Bané served as a Liberal Senator for nearly 30 years. He retired in August 2013 at the age of 75. Pierre De Bané is a former senator. It will be no surprise to the reader when I say that my experience as a Senator was, on the whole, a positive one. I saw firsthand how individual Senators, and the Senate as a central institution of our democracy, can contribute to better government in Canada. I saw the wisdom of the Fathers of Confederation when they created a second chamber that would serve as a source of “sober second thought” on Bills coming forward from the elected House. I saw how Canadians with a wide range of experience in different sectors of society, drawn from all parts of this country, could bring their experience and their voices to bear on difficult questions of public policy. I saw how regional interests could be reflected at the federal level and expressed in a way that complemented the voices of the provinces. Like many other Canadians, I had hoped the Auditor General’s report would forever transform how Senators did their business. Unfortunately, the report seems to have had almost no effect. No such oversight body has been created, and in May of this year, the Senate’s Board of Internal Economy voted to allow Senators to transfer surplus funds from their office and hospitality budgets to their housing accounts. Thus my first recommendation with respect to enabling the Senate to play the role intended under our Constitution is to clean up financial management and control, in a way that gives effect to the recommendations of the Auditor General and in a manner that will restore public confidence in the Senate as an institution. A related change would be to impose stricter controls in areas such as conflict of interest and ethics, where misbehaviour by Senators can bring the perceived integrity of the Senate into question. Beyond that, there is much that can be done to make use of the talents and experience of the independent Senators who have been appointed in recent years. Let me cite five areas where the Senate can contribute significantly to the public interest. The first would involve using the tools and capacities of the Senate to better effect, notably its capacity to hold hearings, conduct longer-term studies, and issue in-depth and relatively non-partisan reports on subjects of public interest. Senate reports lie truly at the heart of the institution. I am thinking in particular of the work by committees such as those chaired by Senator Maurice Lamontagne on science policy, Senator David Croll on poverty, Senator Henry Hicks on the Middle East and Senator Michael Kirby on mental health. Those reports were milestones. In addition, one should not ignore the potential for individual Senators to pursue issues and projects of particular interest to them. This is something that has long been valued in the work of the Senate. I am thinking of such things as Senator Jim Munson’s work on autism, Senator René Cormier as a champion of the Acadians, Senator Ratna Omidvar’s work on immigrants and refugees, or Senator Joan Fraser’s initiatives on literacy among many others. These activities – both individually and in committee – can have considerable influence on public policy, both in Canada and abroad. We now have independent Senators – let’s make full use of their independence, their experience and their imagination. Second, much can be done to restore and reinforce the regional role of Senators, a function originally intended under our Constitution but one that has not received the attention it deserves in recent years. Individual Senators are not there to replace the views of the premiers and the provinces, but they are members of a federal Parliament who need to speak up to ensure and to magnify their region’s voice on legislation and on public policy generally. Third, the Senate could make a considerable contribution to Canada by taking steps to increase the participation of Canadians in the work of Parliament. Just as the Senate, on its website, is seeking the views of former parliamentarians, so too could it seek the views of members of the public on major issues before the country. This could be something along the lines of the “letters to the editor” pages in the newspapers – that is, a website that is lightly curated and lightly edited but done in a way that encourages people to speak up and encourages other Canadians to comment. To better enable this kind of ongoing dialogue, the database of contributions could be made easily searchable on the website. The Senate would then become a home for active, responsible dialogue among Canadians on issues that matter to the whole country. All this would increase both the credibility and the effectiveness of the Senate as a national institution. If the Senate were to adopt this new vision of a chamber with a suspensive veto, this would transform both the work and the credibility of this vital national institution. 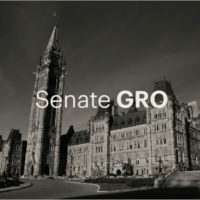 It is my deep conviction that, on the occasion of the next Parliament, a significant initiative to convey the dynamism of the new Senate would be first, to adopt the suspensive veto, and second, to create one or more special committees to undertake studies on subjects of significant importance to Canada that deserve serious examination today. Almost anything to do with constitutional affairs. These are all areas where individual Senators and Senate committees, using the staff and research tools at their disposal, can make an important contribution to the public interest. They are areas where a relatively non-partisan examination of issues and options would be welcomed by Canadians of all political persuasions, including the parties in the House of Commons. *The views expressed in this piece do not necessarily reflect the views of the Government Representative Office in the Senate.